Luckily, there’s a way to have her cake, and for him to eat his too: Enter the groom’s cake. Whether you tend toward the traditional or consider yourself a trendsetter, the custom honors the man of the hour without scarificing event details typically geared toward the bride. “It’s really a great way to do something that is mostly about the groom, honoring him in theme and flavor,” says Mike McCarey, owner of Redmond-based Mike’s Amazing Cakes, known for outlandish groom’s confections ranging from dartboards to Seattle’s own Qwest Field. Out West, the tried-and-true tradition has recently been reinvigorated in wild, gravity-defying designs using modern, sculpted frosting methods and in more modest, subtly masculine creations. “Seattle brides and grooms are amongst the least traditional in the country, taking the expected and tweaking it in a personalized, perhaps whimsical way,” says Lyons. For example, a groom’s cake might still be chocolate, but made to look like a replica of his car. Whether hobby or sports-themed (from ornate drum sets to golf clubs), featuring a hint of eccentric charm (we’ve seen miniature skiers racing down Mount Rainier) or a bit on the wild side (a Volkswagen van you can eat! A log crafted out of chocolate frosting! 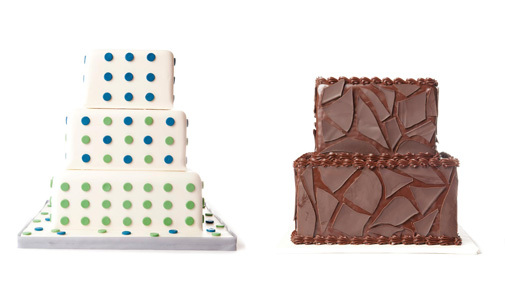 ), these cakes raise the bar on creativity—and add an element of fun. If you’re looking for something more traditional in construction, Judy Tallant of Tallant House suggests trying a nonsculpted option: incorporating a cake flavor near and dear to the groom. “In one recent wedding, the bride conspired with her mother-in-law to create the cake she’d made him every birthday: the cream cheese–cherry pie recipe from a can of Eagle Brand condensed milk,” she says. Tallant also loved a bit more outlandish cake at a recent wedding created out of Hostess cupcakes, candy bars and cans of soda for her snack-junkie groom. If you’re still searching for flavor options, consider paying tribute to local ingredients such as Rainier cherries, for an ode to the place we call home, suggests Lyons. Or, think theme: A Sounders cake, created by Dan Mikosz of Queen Anne–based Decadence Custom Cakes, employs the team’s colors in an elegant way via a classic polka dot motif. 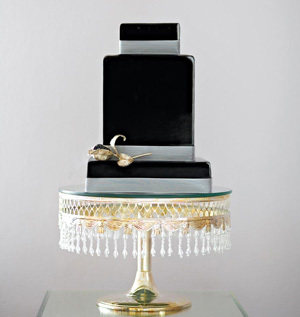 (black and grey cake) Judy Tallant of Tallant House in Monroe found inspiration in a black bento box, a nod to the couple’s first meal together. Three-tier chestnut sponge cake filled with whipped cream, dotted with house-glazed chestnuts and house-candied clementine comfi, covered in chocolate buttercream and air-brushed fondant; $8/slice. 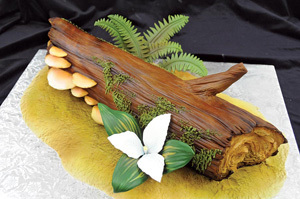 (log cake) This log cake was designed for a client who loves being outdoors in the great Pacific Northwest. “I wanted the cake to reflect things that you might come across in the woods in this area,” says Mike McCarey, owner of Redmond-based Mike’s Amazing Cakes. Chocolate cake with a Bailey’s chocolate-chunk chocolate buttercream filling; about $9/slice. 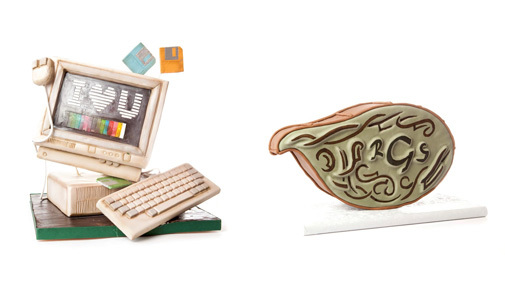 (computer cake) This cake was handcrafted with Seattle techies in mind. “The nostalgia of an ’80s-style computer is something I thought they would smile about,” hints chef Kaysie Lackey of The People’s Cake in Lower Queen Anne. Chocolate stout cake with whiskey chocolate mousse and Bailey’s buttercream with fondant and chocolate, covered with sugar paste accents; $15/slice. (green cake) Inspired by a groom’s tattoo, chef Matt Jones updated the design to include his client’s new wife’s initials. “The colors were driven by the Northwest and the groom’s passion for the outdoors.” Vanilla cake with banana liqueur syrup, filled with cinnamon-caramel buttercream and decorated and covered with fondant for a bananas Foster finish; $12/slice. Get more from Seattle Bride! Follow us on Twitter and Facebook.